Thick, smooth sound swells from this old-school Carl Martin compressor, offered at a great price. An optical compressor performs gain reduction control via a light source into a photosensitive cell. As the light source gets brighter, the photo-sensitive cell sends a signal to reduce dynamic range, or what becomes a compressed signal. The Classic Opto Compressor pedal's four controls (from left to right) are the Gain, which controls the 'pre-glow' of the optical circuit (the more you turn this up, the fatter the sound); Level, which controls the overall volume of the compressor; Compression, which controls how hard or soft the compression is; and the Attack control, which takes the signal from transparent to outright total squeeze. The Bypass footswitch engages or bypasses the pedal. The red LED will be on when the compressor pedal is engaged. The Gain knob adjusts how much of the guitar signal you load the circuitry with. If you set the knob at left the compressor will not be very effective, the more you turn right the more effective the compressor becomes. The Carl Martin compression pedal can go from a very mild soft compression to really hard, beefed-up compression at full right. The gain knob will be interactive with the rest of the knobs, so the harder you load the circuitry, the more effective the Comp knob gets. The Carl Martin pedal's Level knob adjusts the output level from the pedal to match your clean sound. This is helpful when you are finished setting the gain, comp, and attack knobs, for the comp effect you want. The level knob can go from below unity level to several dB boost, so you can actually use the Carl Martin Classic Opto-Comp as a boost sustain pedal, to make your singing lead cut through to the audience. When you have set the gain knob to the right amount of signal you want to be compressed, set the amount or degree of compression on the Comp knob, going from nearly nothing at full left, to extreme hard compression at full right. The efficiency of the knob depends on how the gain and attack knobs are set. 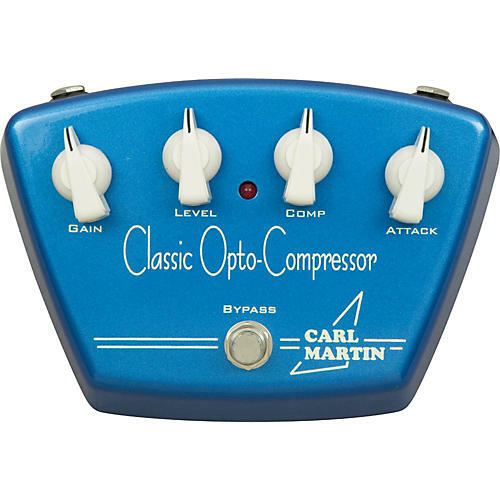 The Carl Martin Classic Opto compressor pedal's Attack knob adjusts and sets how fast the attack/release time shall be. At full left, the attack is fast, giving the compression a more neutral limiter presence. At full right, the compression is much more effective, providing a setting more suitable for fingerpicking style. The Carl MArtin compressor pedal comes in a solid die-cast housing with cool chicken-head knobs, CM color and graphics and a 9v battery compartment.